Folk rock is a hybrid music genre combining elements of folk music and rock music, which arose in the United States, Canada, and the United Kingdom in the mid-1960s. In the U.S., folk rock emerged from the folk music revival and the influence that the Beatles and other British Invasion bands had on members of that movement. Performers such as Bob Dylan and the Byrds—several of whose members had earlier played in folk ensembles—attempted to blend the sounds of rock with their preexisting folk repertoire, adopting the use of electric instrumentation and drums in a way previously discouraged in the U.S. folk community. The term "folk rock" was initially used in the U.S. music press in June 1965 to describe the Byrds' music. The commercial success of the Byrds' cover version of Dylan's " Mr. Tambourine Man" and their debut album of the same name, along with Dylan's own recordings with rock instrumentation—on the albums Bringing It All Back Home (1965), Highway 61 Revisited (1965), and Blonde on Blonde (1966)—encouraged other folk acts, such as Simon & Garfunkel, to use electric backing on their records and new groups, such as Buffalo Springfield, to form. Dylan's controversial appearance at the Newport Folk Festival on 25 July 1965, where he was backed by an electric band, was also a pivotal moment in the development of the genre. During the late 1960s in Britain and Europe, a distinct, eclectic British folk rock style was created by Pentangle, Fairport Convention and Alan Stivell. Inspired by British psychedelic folk and the North American style of folk rock, British folk rock bands began to incorporate elements of traditional British folk music into their repertoire, leading to other variants, including the overtly English folk rock of the Albion Band and Celtic rock. An excerpt from the Kingston Trio's hit recording of the traditional folk song " Tom Dooley". The song reached #1 on the Billboard Hot 100 chart in 1958 and provided a template for the nascent "collegiate folk" movement, which itself was one of the foundation stones of the mid-1960s folk rock boom. Bob Dylan was the most influential of all the urban folk-protest songwriters. The vast majority of the urban folk revivalists shared a disdain for the values of mainstream American mass culture  and led many folk singers to begin composing their own "protest" material. The influence of this folk-protest movement would later manifest itself in the sociopolitical lyrics and mildly anti-establishment sentiments of many folk rock songs, including hit singles such as " Eve of Destruction", " Like a Rolling Stone", " For What It's Worth", and " Let's Live for Today". Beginning in 1964 and lasting until roughly 1966, a wave of British beat groups, including the Beatles, the Rolling Stones, the Dave Clark Five, Gerry & the Pacemakers, the Kinks, and Herman's Hermits amongst others, dominated the U.S. music charts. These groups were all heavily influenced by American rock 'n' roll, blues, and R&B—musical genres they had been introduced to via homegrown British rock 'n' roll singers, imported American records, and the music of the skiffle craze. These UK groups, known collectively as the British Invasion, reintroduced American youth culture to the broad potential of rock and pop music as a creative medium and to the wealth of musical culture to be found within the United States. The subtle folk influences evident in such Beatles' songs as " I'm a Loser" were important in demonstrating how folk-based chord progressions and melodies could be to assimilated into pop music. The use of folk influences in the Beatles' music became even more explicit during 1965, with the release of " You've Got to Hide Your Love Away". Of particular importance to the development of folk rock by the British Invasion were the subtle folk influences evident in such Beatles' compositions as " I'll Be Back", " Things We Said Today", and " I'm a Loser",  with the latter song being directly inspired by folk singer-songwriter Bob Dylan. In the opinion of Roger McGuinn of the Byrds, writers who attempt to define the origins of folk rock "don't realise that the Beatles were responsible as far back as 1963". He cites " She Loves You" as one of the first examples where the Beatles introduced folk chord changes into rock music and so initiated the new genre. These songs were all influential in providing a template for successfully assimilating folk-based chord progressions and melodies into pop music. This melding of folk and rock 'n' roll in the Beatles' music became even more explicit during 1965, with the release of " You've Got to Hide Your Love Away", a folk-derived song with introspective lyrics, again influenced by Dylan. Although the Beatles themselves utilized folk as just one of many styles evident in their music, the underlying folk influences in a number of their songs would prove to be important to folk rock musicians attempting to blend their own folk influences with beat music. An excerpt from the Byrds' version of " Mr. Tambourine Man", highlighting the song's blend of abstract lyrics, folky melody, jangly 12-string Rickenbacker guitar, clear vocal harmonies, and Beatlesque beat. Bringing It All Back Home was released on 22 March 1965,  peaking at number 6 on the Billboard Top LPs chart and #1 on the UK Album Chart. The album's blend of rhythm and blues-derived rock and abstract, poetic lyrics was immediately influential in demonstrating that intelligent lyrical content could be wedded with rock 'n' roll. The songs on the album saw Dylan leaving folk music far behind. Even with this folkier, acoustic material, Dylan's biting, apocalyptical, and often humorous lyrics went far beyond those of contemporary folk music,  particularly the folk-protest music with which he had been previously associated. Much of the early folk-rock music emerged during a time of general global upheaval, the Vietnam War, and new concerns for the world by young people. In the United States, the heyday of folk rock was arguably between the mid-sixties and the mid-seventies, when it aligned itself with the hippie movement and became an important medium for expressing radical ideas. Cities such as San Francisco, Denver, New York City and Phoenix became centers for the folk rock culture, playing on their central locations among the original folk circuits. The "unplugged" and simplified sound of the music reflected the genre's connection to a critical view of a technological and consumerist society. Unlike pop music's escapist lyrics, arguably a fantasy distraction from the problems in life, folk artists attempted to communicate concerns for peace, global awareness, and other touchstones of the era. Bands whose music was significantly folk rock in sound during the mid-to-late 1960s included Donovan,  the Lovin' Spoonful, the Mamas & the Papas,  the Youngbloods, Love, and, in their early years, Jefferson Airplane. In the mid-1960s, singer-songwriter Gordon Lightfoot began moving his folk songs into a folk-rock direction with recordings such as the percussion-driven "Black Day In July" about the 1967 Detroit riot. He would rise to top the charts in the 1970s with a number of his folk-rock recordings such as " Sundown" and " Carefree Highway" and eventually become known as a folk-rock legend. Some artists who originally produced with a harder edged rock sound found the ability to communicate more easily and felt more genuine in this method of delivery. In this category was Cat Stevens, who began in London much like the Byrds did in the United States but toned down the sound more frequently with acoustic instruments. He performed songs that contained concern for the environment, war, and the future of the world in general. The Canadian singer-songwriter Joni Mitchell won many Grammy Awards with her folk rock/pop songs. The subgenre was further popularised in 1973 by Thin Lizzy, who had a hit with " Whiskey in the Jar", a traditional Irish song performed entirely in the rock idiom. Throughout the 1970s, Celtic rock held close to its folk roots, drawing heavily on traditional Celtic fiddle, pipe, and harp tunes, as well as traditional vocal styles, but making use of rock band levels of amplification and percussion. In the 1980s and beyond, Celtic rock was perpetuated by bands such as the Pogues, the Waterboys, Runrig, Black 47, and the Prodigals. A more recent folk rock band based in England is the BibleCode Sundays. Celtic rock is also popular in Spain where bands such as Celtas Cortos have had a large following since the early 1990s. Folk metal is a fusion genre of heavy metal music and traditional folk music that developed in Europe during the 1990s. It is characterised by the widespread use of folk instruments and, to a lesser extent, traditional singing styles (for example, Dutch Heidevolk, Danish Sylvatica and Spanish Stone of Erech). It also sometimes features soft instrumentation influenced by folk rock. The earliest folk metal bands were Skyclad from England and Cruachan from Ireland. Skyclad's debut album The Wayward Sons of Mother Earth was released in 1991 and would be considered a thrash metal album with some folk influences, unlike Cruachan’s early work which embraced the folk element as a defining part of their sound. It was not until 1994 and 1995 that other early contributors in the genre began to emerge from different regions of Europe and beyond. Among these early groups, the German band Subway to Sally spearheaded a different regional variation that over time became known as medieval metal. Despite their contributions, folk metal remained little known with few representatives during the 1990s. It was not until the early 2000s when the genre exploded into prominence, particularly in Finland with the efforts of such groups as Finntroll, Ensiferum, Korpiklaani, Turisas, and Moonsorrow. The music of folk metal is characterised by its diversity with bands known to perform different styles of both heavy metal music and folk music. A large variety of folk instruments are used in the genre with many bands consequently featuring six or more members in their regular line-ups. A few bands are also known to rely on keyboards to simulate the sound of folk instruments. Lyrics in the genre commonly deal with fantasy, mythology, paganism, history and nature. Steeleye Span, founded by Fairport Convention bass player Ashley Hutchings, was made up of traditionalist folk musicians who wished to incorporate electrical amplification, and later overt rock elements, into their music. This, in turn, spawned the conspicuously English folk rock music of the Albion Band, a group that also included Hutchings. In Brittany folk rock was developed by Alan Stivell (who began to mix his Breton, Irish, and Scottish roots with rock music) and later by French bands like Malicorne. During this same period, folk rock was adopted and developed in the surrounding Celtic cultures of Ireland, Scotland, Wales, Brittany, and Cornwall, to produce Celtic rock and its derivatives. Folk rock also gave rise to the subgenre of Medieval folk rock and the fusion genres of folk punk and folk metal. By the 1980s the popularity of British folk rock was in steep decline but it has survived into the 21st century and has been revived as part of a more general folk resurgence since the 1990s. British folk music has also been influential in those parts of the world with close cultural connections to Britain, such as the U.S. and Canada. In Romania Transsylvania Phoenix (known in Romania simply as Phoenix), founded in 1962, introduced significant folk elements into their rock music around 1972 in an unsuccessful attempt to compromise with government repression of rock music. The attempt failed, and they ended up in exile during much of the Ceauşescu era, but much of their music still retains a folk rock sound. The present-day bands Spitalul de Urgenţă (Romanian) and Zdob şi Zdub ( Moldova) also both merge folk and rock. Although large number of Yugoslav 1960s beat bands performed and recorded covers of Balkan traditional songs, it was the late 1960s and early 1970s when the Yugoslav rock bands started incorporating folk elements into their own compositions. Progressive rock bands Korni Grupa and YU Grupa and acoustic rock band S Vremena Na Vreme were pioneers in incorporating folk music elements into their sound, and were followed by progressive rock bands Smak and Dah, acoustic rock bands DAG, Suncokret and Rezonansa, and jazz fusion bands Leb i Sol and Den Za Den. Bijelo Dugme, which emerged in the mid-1970s, had huge success with their folk-influenced hard rock sound, becoming the most popular Yugoslav band, managing to sustain this status during the 1980s. However, at the beginning of the 1980s, Bijelo Dugme switched to new wave, and in the late 1980s to pop rock, but their last few releases also featured folk music elements. Late Bijelo Dugme albums influenced a number of pop rock/folk rock bands, mostly from Sarajevo: Crvena Jabuka, Plavi Orkestar, Merlin, Valentino, Hari Mata Hari, Jugosloveni. Several hard rock and heavy metal bands, like Vatreni Poljubac and Griva, incorporated folk music elements into their songs. The singer-songwriter Đorđe Balašević incorporated elements of folk music of Vojvodina into a number of his songs, while some of his albums, like Na posletku... and Rani mraz, were completely folk rock-oriented. Another notable act whose music featured a combination of rock and Vojvodina folk music were the band Garavi Sokak. The band Galija incorporated some folk music elements into their music during the late 1980s and early 1990s, and in 1999 released the album Južnjačka uteha with covers of Serbian traditional songs. The band Azra started their career as a new wave band, but in their late period started to incorporate folk music elements into their music. After the band disbanded, the band's former leader, Branimir Štulić continued to use folk music elements on his solo albums, often recording covers of traditional songs. The songs by the 1975 student ensemble "Ornament" are based on Anglo-American folk music. The group later renamed to Kukuruza and performed from 1986 on as a professional band. The band Kalinov Most was formed that year, releasing their debut album, Vyvoroten, in 1990, which contained "ethnical motiefs and shamanic motets". Numerous bands and musicians have cited this band as an influence, most notably Inna Zhelannaya and the band "Dvurechye". Less-known bands, such as "Ado", performed in the style of folk and country rock. Turkey, during the 1970s and 1980s, also sustained a vibrant folk rock scene, drawing inspirations from diverse ethnic elements of Anatolia, the Balkans, Eurasia and the Black Sea region and thriving in a culture of intense political strife, with musicians in nationalist and Marxist camps. Leading examples are Cem Karaca, Kazım Koyuncu, Barış Manço, Erkin Koray, Fikret Kızılok, Silüetler, Moğollar and left-wing Grup Yorum. The music realizes all kinds of mixtures between folk and rock. There are bands such as Die Streuner whose music is close to medieval music, but there are more bands whose music, though it is close to medieval music, use rock drums and rock-like rhythms and are more or less electrified (Vermaledyit, Feuerschwanz, Saltatio Mortis, Corvus Corax). Many bands plays even more rock-like folk-rock ( Schandmaul, Faun, Ignis Fatuu) although Faun is hard to classify due to musice variation. Some bands play medieval metal ( Tanzwut, In Extremo, Subway to Sally, Rabenschrei). Use of older instruments is common in German folk-rock. The most widely used old instruments in the German folk-rock are perhaps bagpipes, pipes, hurdy-gurdy, nyckelharp, and lute, which often are played together with rock guitar, bass and drums. Tanzwut and In Extremo have for instance two bagpipes players in their heavyband. The German folk-rock scene is largely based on professional musicians, including a number of female multi-instrumental musicians such as Anna Kränzlein (Schandmaul) and Fiona Rüggeberg (Faun). The inspiration of the German folk-rock does not stem from old German music only, but from a variety of other sources such as France, Netherlands, Scotland, Ireland and Sweden. Faun has introduced music from even a wider range of countries. Some German folk-rock bands play Scottish and Irish folk-rock, like The Dolmen and Fiddlers Green (folk-punk). German folk-rock has nothing to do with Schlagers music or traditional brass band music. It is difficult to define the boundaries between folk and ethnic music in Italy, because of its geographic position and its history. The folk side was founded by the Nuova Compagnia di Canto Popolare at the end of the 1960s. The Nuovo Canzoniere Italiano was characterized by musical search and a strong political commitment. In Italy many songwriters imported American models, such as Folk beat n. 1 by Francesco Guccini or to Edoardo Bennato, who mixes country, rock and tarantella. Folk rock roots can be found in two Italian songwriters: Fabrizio De André and Angelo Branduardi. In 1984, Fabrizio De André published the LP Creuza de ma, in Genoese dialect. De André used musical instruments from Bosporus to Gibraltar: oud, andalusian guitar, Macedonian bag pipe, flute, Turkish shannaj, lute, Greek bouzuki and neapolitan mandolin. Branduardi is a classical musician whose first LP Branduardi '74 is near to progressive sound, later he approaches to medieval and rinascimental and Celtic music. In 1985 he sang William Butler Yeats poetry. The violin, the harp, the sitar, the banjo and the lute are accompanied by electric bass and drums. Later he substituted violin with electric violin. In 1982 Lou Dalfin formed an Occitan group which performed traditional music with traditional instruments: ghironda, accordion and organetto, violin, flute, boha and bag pipe, with singing in the Occitan language. A new line-up of the band in 1990 played folk, jazz and rock using electric bass, drums, electric guitar, keyboard and saxophone. In 1988 Gigi Camedda, Gino Marielli and Andrea Parodi founded Tazenda, an Italian ethno-folk-rock group which uses a launeddas (the oldest reed instruments of the Mediterranean), the sampled " canti a tenore", the diatonic accordions are mixed with electric guitars and drums and harmonicas. 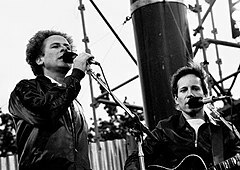 The Gang were formed in 1984 as a punk group, inspired by The Clash, but in 1990 they began to sing about the Italian political and social situation and they moved away from punk-style electric guitar and used acoustic twelve string guitar, violin, accordion, harmonica, and flutes. In 2004, after two rock discs, Gang recorded Nel tempo e oltre cantando insieme with La Macina, a band of musical search from Marche led by Gastone Pietrucci. Traditional songs and Gang's songs were revised rearranged: an example of fusion between rock and popular tradition. In 1991 some performers from Emilia-Romagna founded Modena City Ramblers, which blends the Combat Rock musical style ( The Clash) with folk, traditional Irish music, political songs (Contessa) and partisans' songs (Fischia il vento and Bella Ciao). Later M.C.R. used a world music sound and blended in rock, punk, tape loops and samples, creating a new genre called Celtic patchanka. Many groups were influenced by M.C.R. : Casa del Vento, Fiamma Fumana led by Alberto Cottica (electronic folk); Caravane de Ville of Giovanni Rubbiani; Ductia of Massimo Giuntini; Paulem and La strana famiglia led by Luciano Gaetani; and Cisco (former singer of M.C.R.) now a guitarist and drummer. Other fusions of folk and rock include New Flamenco (Spain), the pop-oriented forms of North African raï music. Spain has produced two folk-rock-bagpipers, Susana Seivane from Galicia and Hevia, who mix traditional with modern dance tunes. Triquel is another Spanish Celtic rock band that combines rock music with Celtic folk roots whereas Mago de Oz is a well known Spanish band which combines celtic folk rock with hard rock. Besides, experimental rock musician Lynda Thomas gained notoriety for fusioning traditional music with rock or eurodance music. Canadian folk rock is particularly, although not exclusively, associated with Celtic folk traditions. Bands such as Figgy Duff, Wonderful Grand Band and Spirit of the West were early pioneers in the Canadian tradition of Celtic-influenced rock, and were later followed by acts such as Crash Test Dummies, Great Big Sea, the Mahones, the Dukhs, Jimmy George, Rawlins Cross, Captain Tractor, Mudmen, and Michou. In recent years, a variety of Canadian indie music has reached the scene with varying styles of folk rock such as Attack in Black, Great Lake Swimmers, City and Colour, The Wooden Sky, Joel Plaskett and Two Hours Traffic. Australia has a unique tradition of folk music, with origins in both the indigenous music traditions of the original Australian inhabitants, as well as the introduced folk music (including sea shanties) of 18th and 19th century Europe. Celtic, English, German and Scandinavian folk traditions predominated in this first wave of European immigrant music. The Australian tradition is, in this sense, related to the traditions of other countries with similar ethnic, historical and political origins, such as New Zealand, Canada, and the USA. The Australian indigenous tradition brought to this mix novel elements, including new instruments, some of which are now internationally familiar, such as the digeridoo of Northern Australia. Notable Australian exponents of the folk revival movement included both European immigrants such as Eric Bogle, and indigenous Australians like Archie Roach, and many others. In the 1970s, Australian folk rock brought both familiar and less familiar traditional songs, as well as new compositions, to live venues and the airwaves. Notable artists include The Bushwacker Band and Redgum. The 1990s brought Australian Indigenous Folk Rock to the world, led by bands including Yothu Yindi. Australia's long and continuous folk tradition continues strongly to this day, with elements of folk music still present in many contemporary artists including those generally thought of as rock, heavy metal and alternative rock. In Japan in the 1960s with the Eleki Boom brought about by The Ventures and The Astronauts touring in the country, bands such as Takeshi Terauchi & Blue Jeans, The Spacemen, and Munetaka Inoue & Sharp Five combined Japanese folk music with surf rock and instrumental rock, often doing instrumental rock renditions of Japanese folk songs. Manila Sound is a subgenre popular in the Philippines (notably in Manila during the 1970s which combined elements of Filipino folk music, rock and roll, jazz and disco. Notable musicians in this genre include Freddie Aguilar, Florante, Heber Bartolome and Banyuhay, Asin, Sampaguita, Rey Valera, Sharon Cuneta, Hotdog, the APO Hiking Society, VST & Co., Rico J. Puno, and Ryan Cayabyab, although only Aguilar's, Florante's, Bartolome's, Asin's and Sampaguita's music can be considered folk rock, with the others' more aptly under the folk pop or simply pop rubric. Belgian-born South African Rock-singer Karen Zoid made headlines when her debut single '' Afrikaners is Plesierig'' (Afrikaans people are Fun) became a hit in 2001. The song is a slightly altered bilingual rock-version of the Afrikaans folk-song of the same name. It also inadvertently kick-started the Afrikaans Rock movement. ^ a b "Folk-Rock Entry". Encyclopædia Britannica. Retrieved 15 March 2010. ^ Richie Unterberger (20 Feb 2014). Jingle Jangle Morning: Folk-Rock in the 1960s. BookBaby. p. 18-19. ^ a b "Folk-Rock Overview". AllMusic. Retrieved 15 March 2010. ^ a b c d e f g h "Folk Rock: An Overview". Richieunterberger.com. Retrieved 15 March 2010. ^ a b "1962–66: American Folk-Rock vs. The British Invasion" (PDF). State University of New York at Oswego. Retrieved 19 March 2010. ^ Graeme Smith (January 1997). "'Wasn't That a Time!' Firsthand Accounts of the Folk Music Revival. Edited by Ronald D. Cohen. Metuchen, N.J. and London: The Scarecrow Press, 1995. 232 pp.Ethnomimesis. Folklife and the Representation of Culture. By Robert Cantwell. Chapel Hill and London: The University of North Carolina Press, 1993. 323 pp.Thirty Years of the Cambridge Folk Festival. Compiled and Edited by Dave Laing and Richard Newman. Ely: Music Maker Books, 1994. 162 pp". Popular Music. Cambridge University Press. 16 (1): 127. doi: 10.1017/s0261143000000787. ^ a b "The Weavers Biography". AllMusic. Retrieved 20 March 2010. ^ The Kingston Trio Billboard Singles at AllMusic. Retrieved 21 March 2010. ^ a b c d Unterberger, Richie. (1999). The Rough Guide to Music USA. Rough Guides. pp. 22–23. ISBN 1-85828-421-X. ^ Gilliland 1969, show 31. ^ Scaduto, Anthony. (1971). Bob Dylan: An Intimate Biography. Grosset & Dunlap. p. 175. ^ a b "British Invasion Overview". AllMusic. Retrieved 9 April 2010. ^ a b "British Invasion Essay". AllMusic. Retrieved 10 April 2010. ^ Frith, Simon; Straw, Will; Street, John (2001). The Cambridge Companion to Pop and Rock. Cambridge Companions to Music. Cambridge University Press. p. 119. ISBN 0-521-55660-0. ^ "House of the Rising Sun – The History and the Song". BBC. Retrieved 2 May 2010. ^ Brinn, David (July 30, 2016). "The Searchers Still on 'Needles and Pins'". The Jerusalem Post. Retrieved February 26, 2018. ^ Scott Schinder (30 Dec 2007). Icons of Rock. ABC-CLIO. p. 160. ^ "Laugh, Laugh song review". AllMusic. Retrieved 10 May 2010. ^ "Donovan Sessionography". Open Road: The Donovan Home Page. Retrieved 11 May 2010. ^ "Judy Henske Biography". AllMusic. Retrieved 11 May 2010. ^ "The Mugwumps Biography". AllMusic. Retrieved 11 May 2010. ^ Creswell, Toby. ; Trenoweth, Samantha (2006). 1001 Australians You Should Know. Pluto Press Australia. p. 79. ISBN 978-1-86403-361-8. ^ "The Seekers Biography". AllMusic. Retrieved 11 May 2010. ^ Norman, Philip. (2009). Buddy: The Definitive Biography of Buddy Holly. Pan Books. p. 5. ISBN 978-0-330-50888-9. ^ Oakley, Giles. (1983). The Devil's Music: A History of the Blues. British Broadcasting Corp. pp. 39–40. ISBN 0-563-21014-1. ^ "Jimmie F. Rodgers Biography". AllMusic. Retrieved 14 April 2011. ^ a b c d e "Mr. Tambourine Man review". AllMusic. Retrieved 15 March 2010. ^ a b c d Gilliland 1969, show 33. ^ a b "The Byrds Biography". AllMusic. Retrieved 15 March 2010. ^ "Roger McGuinn: Founder of the Byrds". Roger McGuinn Home Page. Retrieved 15 May 2010. ^ "Musicians Associated with the Byrds: The New Christy Minstrels". ByrdWatcher: A Field Guide to the Byrds of Los Angeles. Archived from the original on 28 October 2010. Retrieved 15 May 2010. ^ "About ... David Crosby". Crosby CPR Home Page. Retrieved 15 May 2010. ^ David, Fricke (2001). The Preflyte Sessions (booklet). The Byrds. Sundazed Records. ^ a b Gilliland 1969, show 36. ^ "Love Biography". AllMusic. Retrieved 12 May 2010. ^ "In The Beginning". ByrdWatcher: A Field Guide to the Byrds of Los Angeles. Archived from the original on 24 May 2009. Retrieved 15 May 2010. ^ Fricke, David (1990). The Byrds (booklet). The Byrds. Columbia Records. ^ Creswell, Toby (2006). 1001 Songs: The Great Songs of All Time and the Artists, Stories and Secrets Behind Them. Da Capo Press. p. 59. ISBN 978-1-56025-915-2. ^ "Fairport Convention - Liege & Lief (Deluxe Edition) review". Record Collector. Retrieved 16 May 2010. ^ a b "Bringing It All Back Home review". AllMusic. Retrieved 4 June 2010. ^ "Like a Rolling Stone review". AllMusic. Retrieved 13 June 2010. ^ "Subterranean Homesick Blues review". AllMusic. Retrieved 4 June 2010. ^ Unterberger, Richie. "Great Moments in Folk Rock: Lists of Author Favorites". www.richieunterberger.com. Retrieved 26 January 2011. ^ a b "Country-Folk Overview". AllMusic. Retrieved 24 March 2010. ^ "Description of Country-Folk". Rhapsody. Retrieved 24 March 2010. ^ "Country-Rock Overview". AllMusic. Retrieved 24 March 2010. ^ a b "Celtic Rock Overview". AllMusic. Retrieved 26 March 2010. ^ a b c d "The story of Celtic Rock". Rambling House: Home of Irish Music on the Web. Archived from the original on 15 October 2009. Retrieved 15 March 2010. ^ "Open Road review". AllMusic. Retrieved 26 March 2010. ^ Johnston, Thomas F. (June 1995). "The Social Context of Irish Folk Instruments". International Review of the Aesthetics and Sociology of Music. Croatian Musicological Society. 26 (1): 35–59. doi: 10.2307/836964. ^ Dave Simpson, "Boogie knights", The Guardian (London), 29 June 2006, retrieved 22 January 2009. ^ a b "British Folk-Rock Overview". AllMusic. Retrieved 15 March 2010. ^ Lusk, Jon (2 January 2010). "Tim Hart: Founder-member of Steeleye Span Obituary". London: The Independent. Retrieved 26 March 2010. ^ "The Albion Band Biography". AllMusic. Retrieved 15 March 2010. ^ "Alan Stivell Biography". AllMusic. Retrieved 15 March 2010. ^ "Punk As a Rebirth of Shamanist Folk Music". Grandpierre Attila (in Hungarian). 1989-01-01. Retrieved 2018-12-06. ^ ""Ят-Ха" в Абакане: Конец всем войнам! Во всем мире будет звучать одна музыка!". tuvaonline.ru. Archived from the original on 1 September 2009. ^ Aliya Sabirova. "Захир Насыйбуллин: "Наши подвиги еще никто не повт". «Молодежь Татарстана» №30, 26 мая 2006г. Archived from the original on 6 August 2007. ^ А. Бурлака. "Фолк-рок". megabook.ru. Archived from the original on 22 October 2012. ^ "Кукуруза: История". kukuruza.info. Archived from the original on 14 February 2012. ^ Евгений Богачков. "Калинов Мост: История". kalinovmost.ru. Archived from the original on 14 February 2012. ^ Сергей Калугин отпразднует 15-летие "Нигредо" (in Russian). NEWSmusic.ru. Retrieved 30 April 2012.